While You Are Dining: Meers Burger... Tasty! Tried the world famous Meers Burger made with their own herd of Longhorns and grass fed to boot! 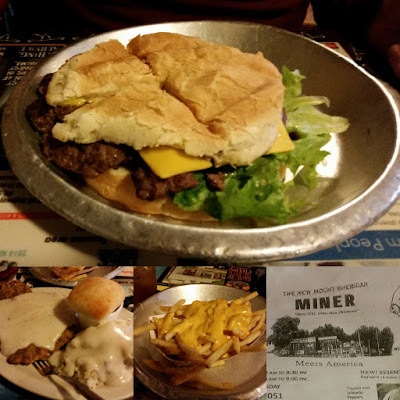 Went with the Meers Burger and Chicken Fried Steak... lots of food! Very tasty! Welcome to "While You Are Dining"! Our intentions are to provide readers suggested foods to order at local eateries in the Collin County (Texas) area. We are adventurous and take the Dalai Lama's advice to "cook with abandon" to the next step - Eating! Thanks for visiting and check in from time to time for new postings. Revisited: We learned from our last visit to Purgatory Road's Sac-N-Pac is it is a Stripes now, and the sauce as changed. Our quest for the best tasting Red and Green Sauces for Breakfast Tacos continues with our current top choice being El Grande Burrito in Allen, TX. - "Doppelganger" - Tastes just like the original Sac-N-Pac sauces! - "Tasty" - Not like the original Sac-N-Pac but would come back for more. - "It'll Do" - Still not like the original Sac-N-Pac; would come back when in a bind like when the other "Tasty" locations are closed. - "Ouch" - So bad, won't come back even when others are closed.